The Graphics Window provides visual output from OOF2, and is the home of all operations that require user interaction with graphical representations of Microstructures, Images, Skeletons, and Meshes. The Canvas is where OOF2 draws Microstructures. 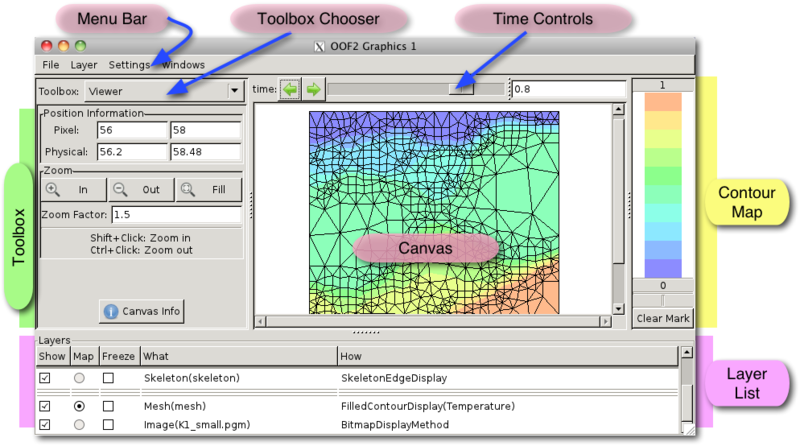 The Time Controls display and change the time of the Microstructures displayed on the Canvas. The Toolbox to the left of the Canvas controls how OOF2 responds to mouse clicks on the Canvas. The Toolbox also displays information in response to mouse clicks. OOF2 contains many different Toolboxes. The Toolbox Chooser at the top of the Toolbox pane switches between them. The Layer List at the bottom of the window lists the contents of the Canvas. It also provides a quick way of turning different parts of the display on and off. The Contour Map to the right of the Canvas displays the colors used in contour plots. The Menu Bar at the top of the window contains commands that adjust the behavior of the window and provide alternate ways of performing some basic tasks. The objects displayed in the Canvas are arranged in Layers. Each Layer obscures the layers below it, and is obscured by the Layer above it. Each Layer displays some aspect of a single OOF2 object, either a Microstructure, Image, Skeleton, or Mesh. Some Layer are created automatically when a Graphics Window is opened. Other Layer are created by the Layer Editor. Each Layer is drawn on the Canvas by a DisplayMethod object. The documentation for DisplayMethod lists all of the DisplayMethod subclasses, and indicates which types of object each subclass can draw. When new Layers are added to a Canvas, OOF2 attempts to insert them so as to minimize the amount of useful information that each Layer obscures in the Layers below it. Layers containing sets of points are drawn above Layers containing sets of lines, and Layers containing lines are drawn above Layers containing filled polygons or bitmapped Images. This ordering can be changed by explicitly moving Layers around in the Layer List.